Greece's unemployment rate reached a record high of 25.4 percent in August, with 1 in 4 of the country's workers now jobless, the country’s statistics service reported. The figure is more than double the eurozone average of 11.5 percent for August. 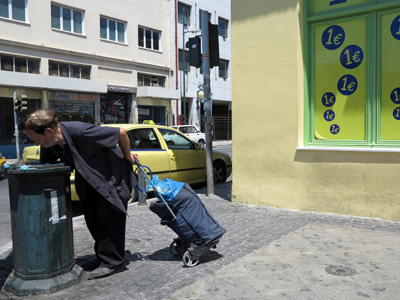 ­The unemployment rate in Greece has increased by 0.6 percent points since July, when it recorded at 24.8 percent, ELSTAT reported on Thursday. The figure marked the 35th consecutive month of rising unemployment in Greece. 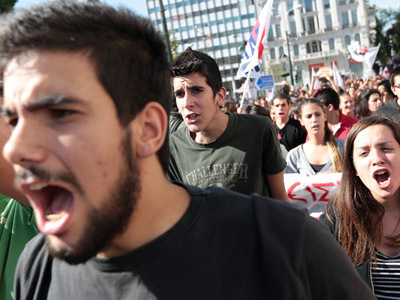 The report states that in August, 36.5 thousand Greeks lost their jobs, bringing total unemployment to 1.27 million. Young people are the group hardest hit by employment, with a 58 percent jobless rate for those between the ages of 15 and 24. Greece is one of the European countries hardest hit by austerity measures and an ongoing recession. As a condition for receiving bailout loans from international creditors, several consecutive governing coalitions in Greece have imposed harsh spending cuts to curb budget deficits. The Greek parliament voted to pass the latest austerity package Wednesday as thousands rallied in protest against further spending cuts. 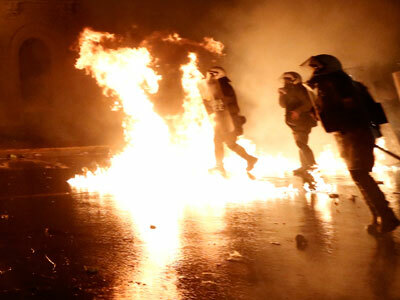 Riots broke out on news that the further belt-tightening measures had been approved. At least 100 people were arrested as firebomb-throwing demonstrators clashed with riot police, who used tear gas and water cannons to quell the protests.